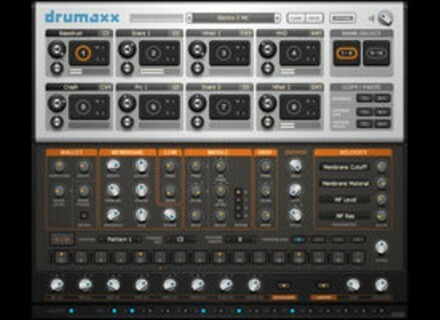 Drumaxx, Virtual Percussion Synth from Image Line. 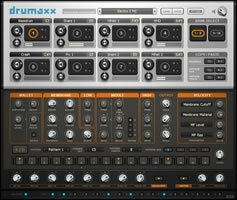 Image Line has announced the release of Drumaxx, a percussion modeling instrument designed to give you control over 16 physically modeled drum pads that can be routed to independent outputs for external effects processing. It was formerly announced as "Drumatrix". 16 Physically modeled drum pads. Huge range of modeling possibilities covering sounds from cymbals to kettle-drums. Single-pad version 'Drumpad' available for tight integration with FL Studio. Image Line is launching Drumaxx with the "pay what you think it's worth" system (minimum €9 [EUR] to cover costs). Also, Image-Line says it will donate $1 [USD] from each sale to support Haiti earthquake victims. This offer will run until the end of March, 2010. Drumaxx is available now for Windows and Mac OS X in VST and AU instrument formats (and native FL Studio plug-in format too of course). Producer Loops Ambient Glitch Vol.3 Ambient Glitch Volume 3 expands on his series of atmospheric sample packs by sound designer Jeff Rhodes. WOK Blip2000 WOK has released Blip2000, a "matrix-sequencer" VST instrument plug-in for Windows. Maik Menz TranceDrive Maik Menz has announced the release of TranceDrive, a new free VST instrument plug-in for Windows.